PHILADELPHIA (WPVI) -- 396 hats. Philadelphia Flyers fans threw 396 hats onto the ice at the Wells Fargo Center back on February 28 when they believed forward Wayne Simmonds scored a hat trick. It turned out what was believed to have been Simmonds' third goal of the first period against the Colorado Avalanche was actually credited to forward Jakub Voracek. When PA announcer Lou Nolan announced the score, the Flyers faithful booed - after all, they had just thrown their hats away. "I hope it's the last time I get booed after I score," Voracek said at the time. "I thought (Simmonds) had it and when he told me he didn't touch it, I thought, Oh my God, this is going to be interesting.'" The Flyers went on to win the game 4-0. Now, Voracek is turning that mix-up into a good deed. 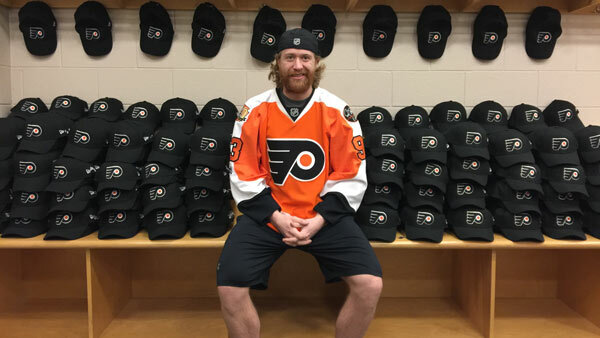 Voracek has bought 396 Flyers hats! He is donating them to patients at local children's hospitals: Children's Hospital of Philadelphia, St. Christopher's Hospital for Children, and Shriners Hospitals for Children. No mix-up here, just another nice move from Voracek, this time off the ice.